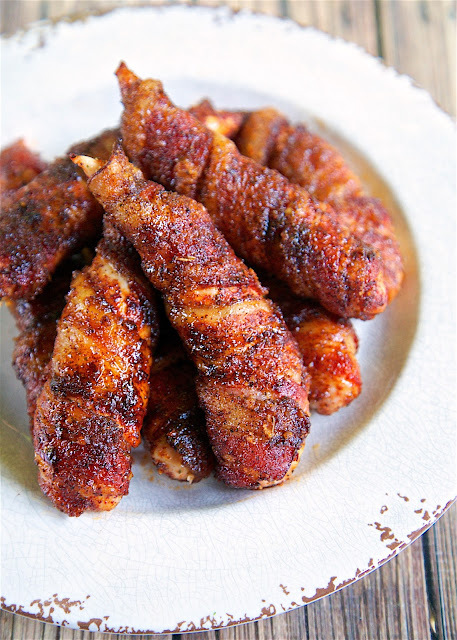 Sweet & Spicy Bacon Wrapped Chicken Tenders - one of the best things we ate last week. Only 4 simple ingredients - chicken, bacon, brown sugar and chili powder. They only take about 5 minutes to make and are ready to eat in under 30 minutes. Sweet and salty in one bite! Chicken tenders are one of my favorite quick dinners. They can be prepped and ready for the oven in minutes. They also don't take long to cook. That is a winner winner chicken dinner! 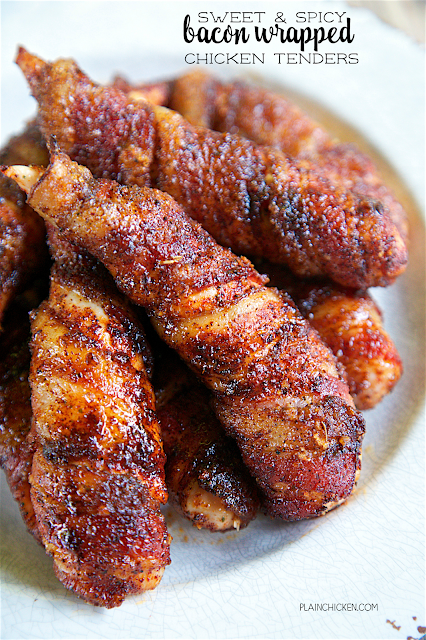 These Sweet & Spicy Bacon Wrapped Chicken Tenders were one of the best things we ate last week. There are 4 simple ingredients in this recipe - chicken, bacon, brown sugar and chili powder. You probably already have everything in the house! They honestly only take about 5 minutes to make and are ready to eat in under 30 minutes. Sweet and salty in one bite! They do have a tiny little kick from the chili powder, so feel free to adjust the amount depending on your preference. Preheat oven to 375 degrees. Line a rimmed baking sheet with foil and top with cooking rack. In a shallow dish, combine brown sugar and chili powder. Wrap each chicken tender with one slice of bacon. Coat bacon wrapped chicken tenders with the brown sugar and chili powder mixture. Place on baking sheet. Bake for 20 to 25 minutes, until bacon is crisp. This is the second delicious looking bacon wrapped chicken dishes I've read this morning. I'm so making this tonight! These look delicious! What would you suggest as a side dish? Are these breaded chicken tenders? No. Use boneless, skinless chicken tenderloins from the meat section. Do not cook them ahead of time. I have made these countless times, always to rave reviews !! My recipe came from Paula Deen's list of goodies years ago. It takes a bit of time to roll the chicken up in the bacon but it is well worth the effort. I even sent the recipe to a friend in England who was having a cocktail party and everybody across the pond loved them !! I just made this last night for dinner, thanks for the recipe! I baked the chicken for 25 minutes & it came out incredibly tender. There was also a lot of oily juice left over, but I still made a side sauce for the chicken: a 1/4 cup of honey dijon mustard & a 1/4 cup of maple syrup. A dash of honey too. Simply delicious! Can I cook this on my outdoor grill? Do you use "light" or "dark" brown sugar? They are always delicious when I make them however my bacon is never crunchy....any suggestions?